Southern Kings winger Yaw Penxe is hoping to use his involvement with the SA under-20 side as a stepping stone to the dream of donning the green and gold of the Springboks one day. The 19-year-old was recently included in the Junior Springboks’ extended squad ahead of the selection of a preliminary squad ahead of the 2017 World Rugby Under-20 Championship to be held in Tbilisi, Georgia next year. Penxe expressed his excitement at the opportunity to be involved at a national level, following an impressive year with the Eastern Province Kings at under-19 level as well as in the Currie Cup Qualifiers in 2016. “It really means a lot to me to be part of the extended squad. This is something I have been working towards and it has taken a lot of hard work. This is my first time that I am involved with a national squad, and I am therefore learning a lot and look forward to gaining as much as I can from the national coaching staff,” he said. While admitting that it is still early days to be excited about the prospect of representing his country on the international stage in the World Rugby Under-20 Championship, which takes place between May 31 until June 18 next year, Penxe is motivated by merely being part of the Junior Springboks setup. “We are still a big squad of about 80 players at the moment, but if I were to be selected in the final squad, it would mean a lot to me. It is every player’s dream to wear the green and gold. It is something I think about,” he said about the possibility of being part of a side that would want to emulate the SA under-20 side that lifted the trophy in 2012. 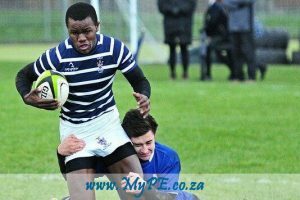 Penxe, who was born in Queenstown and educated at Queen’s College, represented Border at the 2015 Under-18 Craven Week competition before joining the Eastern Province Kings. While at Queen’s College he was also part of an exchange program in his Grade 11 year which saw him visit England where he spent time and played for Kirkham Grammar School’s First XV in Lancashire. Penxe is now enjoying being part of the Southern Kings‘ Super Rugby squad where he is gaining plenty of experience in pre-season training. “This is a big step up from under-19 rugby, even though it has only been training so far. I am gaining a lot from my teammates and the coaching staff, learning what to do better. It’s been a really great vibe,” he said.